Carlos Burle a surfer from Brazil might have set a new world record for surfing the largest wave after he rode a wave estimated to be 100-feet high off Portugal’s coast. Burle took on the ominous looking wave while he was surfing Monday off Praia do Norte, which is a fishing village on the Atlantic coast of Portugal. 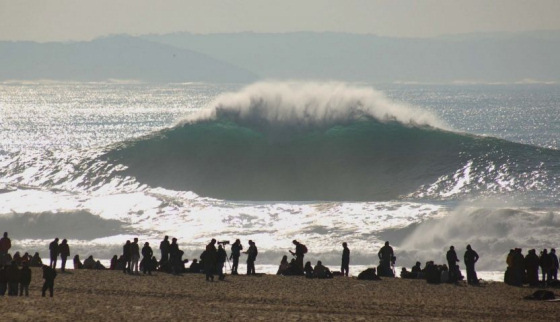 Media reports from agencies covering surfing and witnesses that were there suggested it might have been the largest wave ever surfed. Witnesses said a great deal of screaming and shouting took place when Burle began riding the wave. Burle however told a surf magazine that he was just yelling that it was just a big day and everyone needed to stay focused to catch the big waves. Maya Gabeira, another surfer from Brazil, almost drowned and had to be transported to a hospital when she broke an ankle falling from one of the bigger waves. Gabeira said she was okay following her trip to the hospital, but upset she will be off her board for a while. Burle said it was only luck when he caught the wave, as everyone else had already ridden a big wave and he had yet to catch one. He said he had a big adrenaline moment catching the wave following the accident that broke Maya’s ankle. Garrett McNamara a surfer from Hawaii caught a wave that was 78-feet high near the same location during November of 2011. At that time, it was determined to be a new record and subsequently certified by the Guinness World Records. The Hawaiian is 45 and a pro from the North Shore in Oahu and was honored by the navy in Portugal with the Medalha Naval de Vasco de Gama for the strength he exhibited in riding the huge wave.